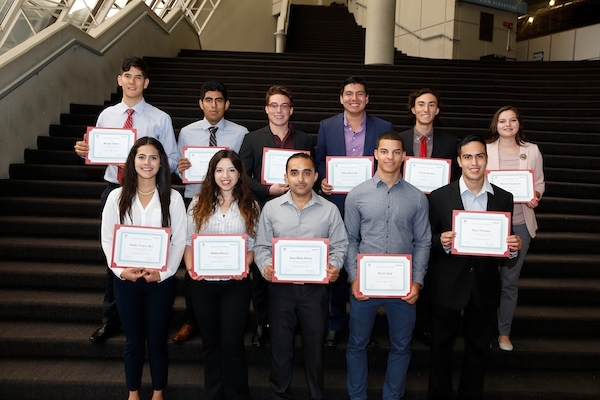 Today Honda and the Hispanic Scholarship Fund (HSF) honored 16 notable Latino undergraduate students from around the country for their academic achievements. The students’ recognition came at the annual Scholar Awards Breakfast in Columbus, Ohio. Each student awarded at the breakfast is also eligible to receive up to a $5,000 scholarship that will help pay for tuition, books, and living expenses. This year, for the first time, Honda will be giving the students the chance to interview on-site for its summer immersion internship program. The internship provides accepted applicants with an in- depth experience in an automobile manufacturing environment. After Scholar Awards Breakfast, the students were taken to Honda’s headquarters in nearby Marysville, Ohio, for a look at the company’s manufacturing and research and development operations. They also learned about the company’s history in the state by touring the Honda Heritage Center Museum.